Riding on the duo’s partnership, England now has a 283-run lead with five more sessions of play left. 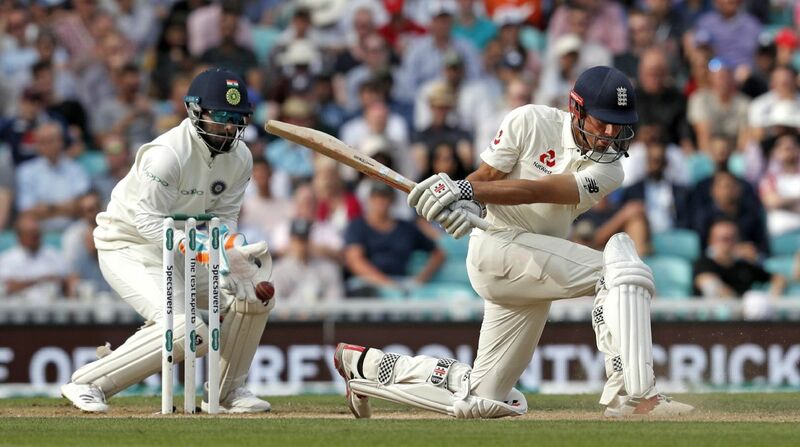 A 129-run partnership between opener Alastair Cook (103 batting) and Joe Root (92 batting) put England in the driver’s seat in the fifth and final Test against India at the Oval here on Monday. Cook, playing his last Test, notched up his 33rd Test ton and also became the fifth batsman in the history of the game to hit a ton both in his debut and final games. The England opener had also scored a century in the second innings of his debut Test, against India, in Nagpur in 2006. Cook, 33, meanwhile also became the highest Test run-scorer among the left-handed batsmen as he went past Sri Lanka’s Kumar Sangakkara (12400), adding another achievement to his illustrious career. Earlier, resuming the fourth day at 114/2, both the English batsmen looked in solid control, making the visitors struggle for a breakthrough. After being bowled out for 332 in their first innings, the hosts restricted India to 292 all out to take a 40-run lead. England were on 243/2 when the umpires called for the lunch break. Brief scores: England 332 and 243/2 (Alastair Cook 103, Joe Root 92; Mohammed Shami 1/50) vs India 292 at Lunch on Day 4.